WE ARE DEDICATED TO DOING EVERY JOB RIGHT, THE FIRST TIME. We are an industry leader in basement waterproofing, foundation repair, and drainage solutions. At Western Construction Systems, we’re not selling a product, we’re selling solutions. We value customer satisfaction and meeting the needs of our clients by offering superior service, quality products, and competitive pricing. Professional and friendly service throughout. Excellent quality workmanship delivered promptly and on bid. These guys are great. Western Construction was extremely easy to work with and provided excellent service. I truly appreciate the great work they did on our foundation. Tyler did a great job. It was a bit confusing because I had to be out of Salem, but Tyler figured out the best solution and got the job done in a timely and cost effective manner I really appreciate it. We know that for many homes built prior to the 1940’s, the weight of the home is the only thing holding the structure to the foundation. At Western Construction Systems, we perform structural retrofit, which attaches the structure to the foundation, reducing the ability for movement during a seismic event. Our system ensures that your home is firmly attached to your foundation, and we then provide you with a certificate of completion which can be used to obtain earthquake insurance. Schedule your complimentary site inspection to learn how affordable earthquake retrofitting really is. At Western Construction Systems, we have restoration solutions for 95% of the foundations we inspect. We are experts at finding repair and restoration solutions when a foundation replacement may have been recommended. Our process of repairing and restoring foundation walls provides a cost effective opportunity for us to complete the work without having to replace the foundation. We implement a variety of repair methods, depending on the type and severity of damage. Repair solutions may include crack injection, steel reinforcing, stabilization, carbon fiber reinforcing or acrylic cement reconstruction. Schedule your complimentary site inspection to learn more about our repair methods. At Western Construction Systems, we are experts at basement waterproofing in homes built prior to the 1940’s. We have the proven methods to confidently solve any basement waterproofing project and our proprietary applications are for exterior and interior solutions, thereby eliminating the need to excavate in most cases. As home or business owners, it’s imperative to have proper de-watering and drainage solutions. At Western Construction Systems, we provide our clients with below slab de-watering systems, exterior french drains, storm drains, and sump pumps. Our experienced project managers can help you find the best answers to your drainage questions, and can design the most effective system for your situation during a complimentary site inspection. At Western Construction Systems, we specialize in concrete crack repair. We utilize a variety of methods to structurally repair and waterproof fractures. Some of the methods we have developed include, but are not limited to: Crack Injection, High Strength Reinforced Mortars and Secondary Steel, and Carbon Fiber Reinforcing. Depending on the type and severity of the crack, we will specify the method of repair. Please call us today to schedule your free foundation inspection with one of our project managers. We have the confidence and experience to address all of your foundation repair needs. Western Construction Systems offers a variety of solutions for specialty coatings and concrete sealing. We have decorative glossy sealers, invisible sealers, membrane systems, and the experience and knowledge to handle whatever waterproofing or sealing project you might have. 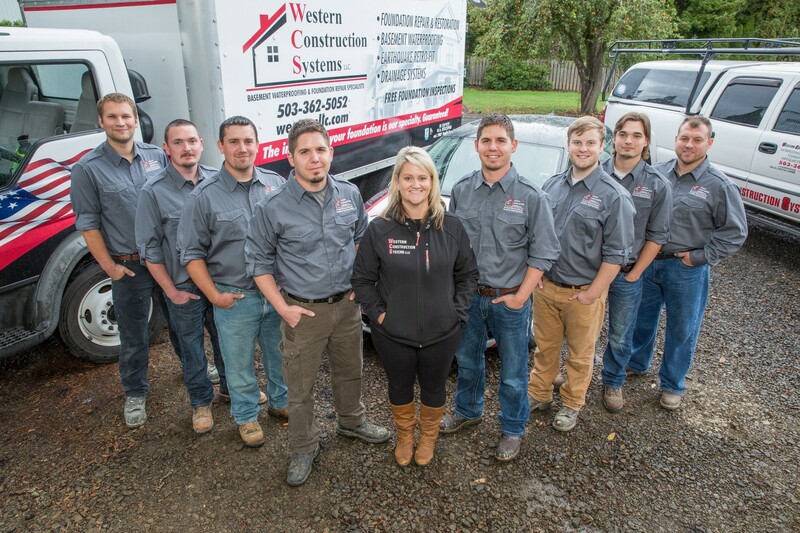 We are a local, family-owned and operated business that has been proudly serving the northwest for over twenty-five years.